The Glite 900 BW System is the most compact gel documentation system on the market. Ideally suited for tight spaces on a bench-top, or in a carrying case for field use, the system both illuminates and captures an image of your gel or blot. The system comes equipped with three different illumination modes. The first, an array of blue LEDs (470nm) situated around the periphery of the glass platen provide excitation light for green–emitting fluorescence dyes. This optimal “transillumination” configuration minimizes ambient background for the most sensitive imaging with non-carcinogenic dyes like SYBR Green. SYPRO RUBY and our own ECOSAFE These blue LEDs are a much safer technology than old-style UV transilluminators because the LEDs are just as sensitive as UV light but they don't damage DNA in an agarose gel and they won't harm your skin or your eyes. The second, This illumination mode utilizes an innovative white LED technology that can be used as a uniform backlight for transparent media such as Coomassie-stained protein polyacrylamide gels. This diffuser technology eliminates “hot spots” due to point illumination and provides maximum clarity for colormetrically-stained gels. 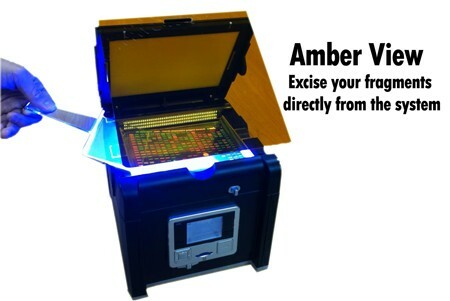 The Third The last mode utilizes white LED epi-illumination for shining directly onto opaque surfaces such as Western blot and similar highly reflective materials. No matter the illumination mode, the system captures images with a high-end, scientific grade, 9 mega-pixel CMOS camera for maximum separation of color and resolution of bands. These images can be saved to a SD card or you can attach an optional Mitsubishi black and white thermo printer directly to the system for quick print outs. Excise your DNA with Amber Screen With GLITE 900BW and ECOSAFE it becomes extremely simple to excise your DNA fragment out of gels. You don't need to wear protective eyewear, or worry about mutagenic dyes. Switch on the blue LEDs and excise your DNA fragment. Fast, precise and totally safe, it’s the 21st century way of working with DNA. Seamlessly stream data to a mobile device With the included PQI Air Card, you can now bypass the computer and directly transfer your GelPic images right to your IOS or Android mobile device. Just insert the PQI Air Card into the SD slot, download the app, and consider the job done! Of course, if you prefer, you can also use the included USB cable to connect directly to a computer (Mac or PC). White LED for protein gels, Western blots and petri dishes Coomassie Blue Gel using white backlit LEDs (left), colormetric Western Blot Image using epi-white LEDs (middle), and a petri dish image using backlit LEDs (right). What’s better than buying the most affordable gel documentation system on the market? Downloading the compatible software used to quantify bands for protein, DNA and RNA gel bands for absolutely FREE. The GelQuant.NET software works with the .jpg output files of the GLite and allows you to determine relative quantities and sizes from standards on the ge..